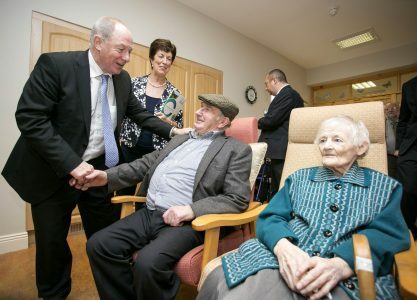 An Cluinín retirement village was created by Kilmaley Voluntary Housing Association in response to an identified need within the rural area of Kilmaley, County Clare. The initial goal was to provide older people who were rurally isolated with the opportunity to grow old in a home environment with support and assistance when required, thereby preventing them from going into long-term care before their time. A survey was carried out of all people living in the area to identify their future needs with regard to age profile, housing needs, healthcare needs, childcare and recreational requirements. One of the findings of the survey was that people were moving into long-term residential care way before their time (some people living in the locality were living in long-term residential care simply because they could not access the services they required. Once the first phase of 12 houses were opened, 4 people were taken out of long-term residential care into supported living in their own homes and community within the development). The organisation created a development from a green field site which consists of 24 single independent living houses with help from an outreach service when required. An outreach service is provided to the houses during the Day Centre’s off hours. In addition, a Day Centre was built which caters to 110 older people in the immediate locality and a Health Centre which accommodates the local public health nurses and doctor service. A bus for the Day Centre, provided by fundraising, is used to include those living in outlying communities. So far, this housing development has created a happy sustainable community for the older generation. It provides a quiet, secure and modern environment for older people in Kilmaley and the surrounding areas, who had become very isolated from basic community services. How collaboration worked: The Kilmaley Voluntary Housing Association was formed as a sub-committee of Meithal Kilmaley Development Association in response to the identified need of the ageing population in the local area. The total cost of the project to date is €4.7 million. €4.2 million funding was received from the Department of Environment within the Irish Government to build 24 houses with additional financial assistance from the Health Service Executive Dept. and local fundraising. Kilmaley Voluntary Housing Association depends on annual fundraising to meet ongoing expenses along with a grant from the Health Service and rent from the residents. This meets the annual costs of staffing, insurance, equipment, materials and food. The running costs of the overall complex are in the region of €300,000 annually. A 'Sinking Fund' was created at the outset from the rent collected, to meet the ongoing maintenance. This is a fund that is created to cover any unforeseen repair costs associated with the buildings. Details on older people's involvement: The retirement village was developed in consultation with older people and the wider community. The wider community encompasses all people living within a 10km radius of the centre. The older residents and wider community support the annual fundraising required to meet the ongoing maintenance costs. The ongoing daily entertainment is provided by the residents themselves in the Day Centre. The residents within the complex look after each other in a very neighbourly manner. This development has been in operation since 2003. On its completion it took 4 people out of long-term residential care and only 1 person has ended up in residential care since its creation. Care and assistance is available to all residents in their homes when required. Overall this development has led to providing older people with a better quality and more fulfilled life, leading to a normal way of growing old in their own home. The Association holds quarterly meetings with the residents and the feedback has been very positive for the services provided. During the last 2 years the Outreach Service has been added to this development following feedback provided by the residents. A very positive response has followed the introduction of this additional service. Overall the satisfaction rating from the feedback received from users of this service seems to have met the initial vision. Not at this time. All of the work has been done on a voluntary basis by a group of 15-20 people over the past 20 years. If new volunteers became involved and there was an increase in the demand for this service, the Association would consider expanding. It may be more beneficial for other rural communities to adopt this model of service provision to older people, rather than over expanding in one particular area. The demand and responsibility on the volunteer wasn't envisaged to be as large as it was. More support and assistance would be required from Statutory Authorities if this project was done again (both financial and advice-giving). As the age-profile of the residents increases, more financial support will be required to provide additional services to meet their needs. Challenges with funding - as a voluntary organisation we were constantly trying to persuade the Government Department to assist us with the expansion of this development. The challenge of integrating new residents into the complex can be very time consuming - the Association is looking at ways of improving the process of integration.